If you’re reading with no prior knowledge; Venom is a symbiotic alien suit currently paired with former Peter Parker bully turned War Hero Flash Thompson. It’s a great comic series and it’s ending soon thus my reason for this countdown of it’s top 7 Story Arcs . Beware Spoilers if you’d like to read these or haven’t read them yet! So without further delay Number 4 on the countdown. Although Venom started up a bit before Scarlet Spider it feels like they very much emerged at the same time. 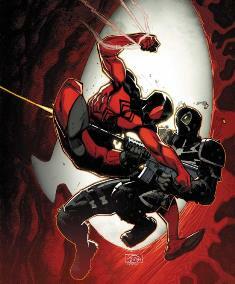 As I read some great issues of Venom my close friend was starting the Scarlet Spider and we exchanged issues a few times. So when it was announced the two would team up it seemed completely natural. What seems kind of strange was that the advertisement featured a tiny Carnage on a syringe as the villain. This was on a poster that hung in my dorm for something like a year because the image was awesome. Anyway as it turns out the reason for the tininess was because all of the stories primary characters were shrunken down and entered the world of the Micronauts! I didn’t know much about the Micronauts or their comic history before reading Minimum Carnage but I remember thinking they were toys and after doing some research…yup they started as toys and became a comic series. Oh and the title is not only a play on the fact that the story involves small people it is also a funny reference to the title of another famous Carnage centered story dubbed Maximum Carnage. Ok so how’s the plot of Minimum Carnage? How do all these rather separate entities and ideas come together? Phenomenally! The story is really fun and both Yost and Bunn do an awesome job coming up with a story that feels huge despite being microscopic. To sum it up in short Carnage is recruited by the big baddie of the Microverse, Marquis Radu, because he wants to replace God. Symbiotes have a rather nasty history with the Microverse because they tend to be toxic to the Microverse itself. So naturally Venom and Scarlet Spider end up following Carnage to the Microverse with intrepid reporter Katy Kiernan. They team up with the Enigma Force a super hero group in the Microverse, which is confusingly also the name of what holds the Microverse together. All teamed up they do manage to expel Carnage but he leaves a blood trail behind him and a lot of tiny clone versions of him self that leave even more of a blood trail in our universe. Despite what could be a pretty silly setting and plot this story somehow manages to be completely enthralling! Scarlet Spider fans get a lot of good stuff as well as Venom fans and even longtime fans of the Micronauts should find the story pretty entertaining. It’s interesting to note that while Venom and Scarlet Spider ally they never become friends or even seem to develop any sort of mutual respect. They are just sort of flung together and work together begrudgingly. They don’t leave with a ‘until we team up again’ instead Scarlet Spider does something pretty shocking and Venom is disgusted by it. I won’t ruin any more of the plot because it’s a great moment and a rare moment I didn’t agree with Venom. The last issue dubbed Minimum Carnage Omega has a really awesome narrative structure that involves a future article Katy Kiernan writes to narrate the present conflict. I also love how there is an almost meta Carnage degrading both Venom and Scarlet Spider by calling them out for not being the actual Spider-Man and Eddie Brock hosted Venom respectfully. 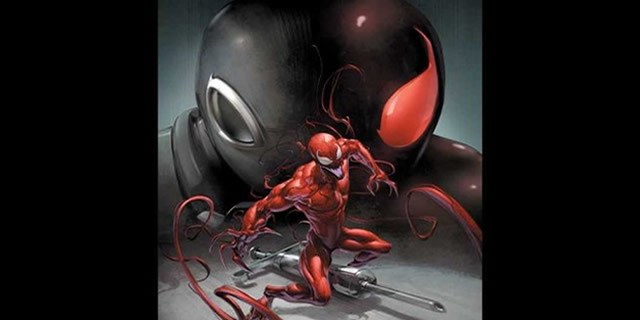 Both of these characters suffer from being seen as some sort of lesser version of Spider-Man which may be true in a very superficial sense but comic characters grow over time just like people and change constantly developing new aspects that they didn’t start with, so that now Venom and the Scarlet Spider are both totally separate entities from Spider-Man but some people will always just see them as the ‘other’ Spider-Man and it is a great little shout out to that when Bunn and Yost have Carnage degrade them by calling attention to that very fact. Before I wrap this up I have to say the art is great throughout and everyone involved came through on it but Medina does some of my favorite scenes in the last issue dubbed Minimum Carnage: Omega. That about wraps it up! Go read it and check back on 9-30-13 for the 3rd part of the big Venom Countdown!